You can now purchase your Link Transit fare media using your smart phone. When you download the Token Transit app, you will have access to single ride tickets, day passes, and a new "rolling" 31-day pass, all with just a few clicks. You will need a credit card to set up your payment account, and an internet connection is required in order to purchase your pass. An internet connection is also required to use your pass for the first time, and for multi-day passes to refresh every day. Single ride tickets are valid for 30 minutes after activation, so make sure you don't activate the ticket until your bus is within sight. Day passes are good until midnight of the day they are activated. And the monthly pass is valid for 31 days from the date of activation. So you can purchase the pass at any time during the month. Once your pass is activated, you open the pass and show your phone screen to the coach operator, just as you would a regular paper pass. Another great feature of Token Transit is the ability to send a pass to another person's phone. 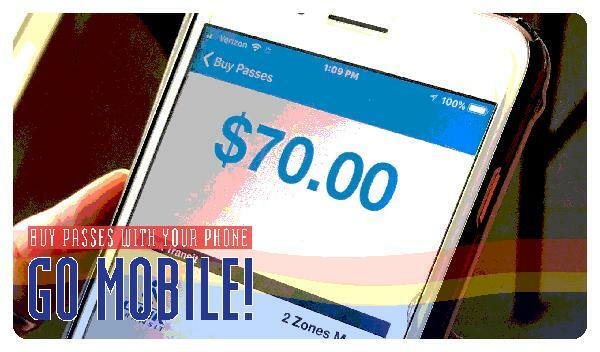 If you are a parent who wants to buy a pass for your kid, you can click here to go to to the Token Transit site and purchase and send any type of pass to anyone you know who may need to use transit. The recipient will get a text message with a link to download the Token Transit app. When they log into the app using their mobile phone #, their pass will be waiting for them. Here is a short video on how the process for purchasing and using your transit fare. For support and questions on the Token Transit app, click here. If you lose your phone, your phone is damaged or broken, or your service is discontinued, you will not be issued a paper pass as a replacement for your mobile pass. You will need to replace your phone, or reestablish service using the same phone number. Once you do so, and download the Token Transit app, your pass will be available for use once again, unless the time period for which it was originally valid for has expired.